Remember when I told you all that you would have a major hand in the story? It’s that time. You’ve read the first fifteen chapters, you know the story so far. Who do you think sabotaged the Kerwood? The Miners, written by David Kristoph are Viktor, Jimmy, Siebert, Jessica and others. The Bridge Crew, written by Greg Dragon are Hayes, Femke, Gauge, Bianconi and others. The Engineers, written by Mark Gardner are Jeremy, Adelaide, Erika and others. Sound out in the poll below, and in the comments on any of the chapters. Maybe you can convince other readers to vote your way. I’ve enjoyed the writings of both David Kristoph and Greg Dragon for a while now. Greg’s space opera, the Anstractor series, is great sci-fi. I’ve read books one and two, and two novellas from his universe. I also enjoyed the not-quite-sequel stories, Re-Wired, and Single Wired Female. David is known for his Tales of a Dying Star series (you already know I like to call it TOADS) that is five books as of the beginning of this project. I’ve reviewed both their works here on the blog, so click here to check them out. Also, be sure to follow David and Greg on Twitter. I wanted to do a collaboration with these two, and I was making some reference covers with some art I found online. I’m not sure what triggered the story idea, but I came up with the space disaster idea and invited David and Greg to collaborate. 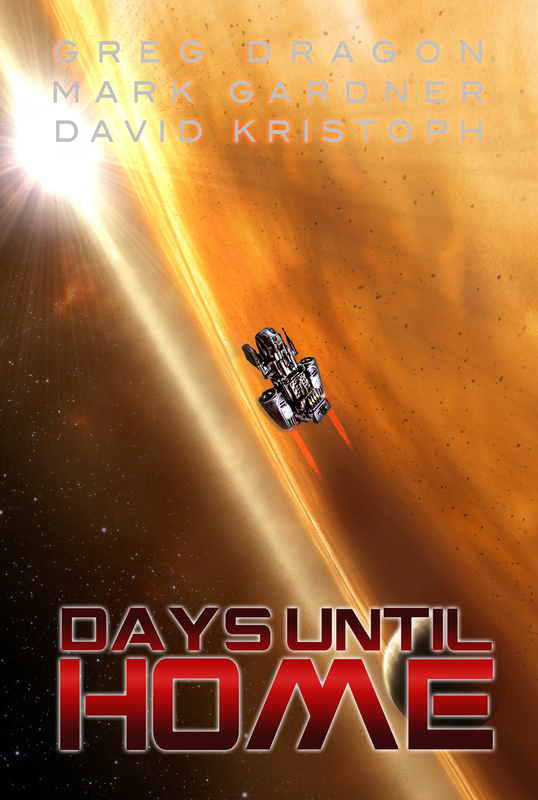 Days Until Home is a 21-chapter space disaster web serial. A ship is on an asteroid belt mining mission, and as the mining comes to a close, a disaster disables the ship and kills most of the crew. Each writer will write exclusively from the point of view of their faction, and each will write as if their faction is responsible for the disaster and thwarting the other two factions. None of the authors will know who the “real” villainous faction is, and as each 2k – 4k chapter is posted, around chapter 15, there will be a vote for the fans to choose the villains, and we’ll write the ending. It’s the perfect opportunity for fans to weigh in on the story’s conclusion. David Kristoph (Tales of a Dying Star) will be writing the point of view of the minors/laborers; Greg Dragon (Anstractor) will write from the POV of the bridge crew and support staff, and Mark Gardner (War of the Worlds: Retaliation) will be writing About the engineers and surveyors. The main goal is this 21-chapter web serial. We’ll probably compile it into a novel for sale in 2017. If this project rocks your world, and we all see value in it, who knows, it could be an annual thing. I think that would be epic. Super excited. Sounds like a great collaboration project. If it’s as successful as I imagine it will be, you should really think about turning it into an audio drama. I’ve become obsessed with full-cast audiobooks and dream of starting my own company, so naturally that’s the first thing I think of, lol. Thanks, Bree! I’ll shoot you an email if you’re interested in listening to a few of my audiobooks. Body Rentals, Forlorn Hope, and Nala’s Story are all on audible & iTunes. This sounds amazing!!! I can’t wait to see how it turns out! Will you be using the same authors each time or different authors for different parts – kind of a round robin thing? See how they take each position into different directions. Hey, Moz! It’ll be a round robin of David-Greg-Me. I look forward to your comments on each chapter. Gotta apologise to you for not reading your stuff lately. I’ve been working on a piece of artwork to hopefully put into an exhibition at the a local gallery. If it gets in, I’ll see if I can put in other work to sell. Life gets to ya, right? I’m super stoked about this project, and I look forward to opinions from down under! I hope you’ll share your art with me so I can share it with my fans. We all hafta look out for each other, right? This is pretty neat, I had no idea you were doing this. I’m going to read a chapter per day at work on my lunch hour — the premise sounds really exciting. I’ll figure out whodunnit or die trying! Thanks, TUS! You’ll have this space disaster on Wednesdays, and I’m continuing the YA story that you liked on Fridays. Be sure to comment on each space disaster chapter to Greg and David in line!